5KPlayer is a freebie but definitely also a goodie that lets you get closer than ever before to the access to free download video (SD & HD) from websites, say, YouTube, Facebook, Dailymotion, Vevo, Vimeo, and the like. Here, you'll learn how to save videos from any website in batch in the easiest way with the help of the top free video downloader, 5KPlayer. How to Free Download Video from Website? You need to download the best free video downloader, 5KPlayer to grab video free from any website including YouTube, Dailymotion, Facebook, Vimeo etc. on both Mac computers (MacBook, iMac, Mac Pro etc.) and Windows PC. If we can free download videos from Websites for offline playback, I bet no one prefers watching his or her favorite video online over and over again, sitting through annoying ads and bufferings. The problem now is how to save videos from any website free of charge. Take it easy, here comes 5KPlayer, a gorgeous free video grabber that receives roaring reputation worldwide. With a focus on providing a way to capture video from websites, roughly speaking, from over 300 sites, including YouTube, Dailymotion, Facebook, Vimeo, Instagram, to name just a few, the amazing free video downloader 5KPlayer not only works perfectly with batch non-HD/HD video download regardless of any formats, be it MKV, AVI, MOV, WMV, MP4, FLV etc. but also allows you to download and convert MP4 to MP3/AAC, FLV to MP3, AVI to MP3 etc. without bothering you to seek for any DVD video converter software for Mac OS or for Windows. After trying to use 5KPlayer to download video from websites for free, you'll find that its download speed is fantastic, to be more specific, it only takes a few seconds to download a music video from YouTube. Follow the guide on how to grab video from websites below and have a try. How to Download Video from Website Free with 5KPlayer? Here I will take downloading videos from YouTube as an example to show you steps to download video from any websites. As it shows below, thanks to its elegant interface, it's pretty easy for users to handle it. Step 1: Free download and run the best free video grabber. Click "YouTube" on the main interface to enter download interface. It is noteworthy that this free video saver is clean, no pop up ads, no malware, no plugins, no virus. Step 2: Copy and paste the URL of YouTube video you wanna download to the box frame. Please make sure that the URL is correct. Step 3: Click "Download" button to download videos from YouTube now. Note: You are allowed to free download videos from Websites like Facebook, Dailymotion, Vimeo, Vevo and other over 300 sites by following the same steps. Apart from free downloading video from websites, the best-ever free online video downloader also serves as a free video player that is capable of playing AVI, MOV, MP4, WMV, MTS, FLV, actually, all the video files, audio files, and even encrypted DVDs(region code 1-6, Disney DRM, DVD CSS etc. ), DVD folders and ISO images. What's more, 5KPlayer also facilitates various needs to airplay videos, for example, you are allowed to stream video audio from iPad iPhone to Mac and stream videos movies from computer to TV. Remember that such a wonderful video grabber software is totally free. This article introduces the best free web video downloader for you to download HD/4K web videos. Find free Facebook video downloader here, and learn to download Facebook videos fast and free of charge by following this guide. 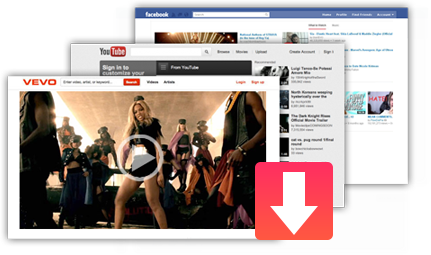 Find superb free video downloader here to free download hot music video, movie soundtracks, movies, TV shows, etc.